Abstract: New water-soluble nontoxic nanocomposites of nanosized silver particles in a polymer matrix were synthesized by a green chemistry method. Nontoxic poly(1-vinyl-1,2,4-triazole) was used as a stabilizing precursor agent in aqueous medium. Glucose and dimethyl sulfoxide were used as the silver ion-reducing agents to yield silver nanoparticles 2–26 nm and 2–8 nm in size, respectively. The nanocomposites were characterized by transmission electron microscopy, ultraviolet-visible and Fourier transform infrared spectroscopy, X-ray diffraction, atomic absorption, and thermogravimetric data analysis. The nanocomposites showed strong antimicrobial activity against Gram-negative and Gram-positive bacteria. Nanocomposite materials containing silver nanoparticles (AgNPs) have unique properties and are used in medicine as effective antibacterial and antiviral agents, and in optoelectronics, nanophotonics, and catalysis.1–6 The properties of AgNPs, eg, their dimensions, distribution, and stability, depend considerably on both the nature of the stabilizing polymeric matrix and the conditions used for nanoparticle formation in the composite. Synthetic (eg, polyvinylpyrrolidone, polyvinyl alcohol) and natural (eg, cellulose, gelatin) polymers can be used as a stabilizing polymeric matrix for AgNPs.3,7–10 Environmentally and biologically hazardous reducing agents, such as sodium borohydride and formaldehyde, are widely used as reducing agents. However, green chemistry principles, including nontoxic solvents such as water and nontoxic reducing agents such as glucose,10–12 dimethyl sulfoxide (DMSO),13 gelatin and sugar,10 tea or coffee,14,15 and plant extracts,16,17 are being increasingly used in the synthesis of AgNPs. In this paper, we report on the green synthesis and characterization of novel nontoxic water-soluble nanocomposites containing AgNPs. Nontoxic PVT (LD50 >5,000 mg/kg) was used as a precursor capping agent in aqueous medium, and glucose and DMSO were used as the reducing agents. The reactions were performed at room temperature in aqueous medium (in the presence of glucose) without additional solvent (ie, DMSO only). AgNO3 and silver acetate (AgOOCCH3) were used as the silver salt precursors. We discuss the results of this research with regard to the main physicochemical properties and antimicrobial activity of these nanocomposites. AgNO3 and AgOOCCH3 (99.9%, Sigma-Aldrich, St Louis, MO, USA) were used as precursors for formation of AgNPs. Glucose and DMSO (99.9%, Sigma-Aldrich) were used as the reducing agents. Nontoxic water-soluble PVT (LD50 >5,000 mg/kg, molecular weight 26 kDa) was used as the stabilizing agent. PVT was synthesized by radical polymerization of 1-vinyl-1,2,4-triazole in dimethyl formamide under the action of azobisisobutyronitrile (1% from the monomer mass) at 60°C in an argon atmosphere (Figure 1). Figure 1 Synthesis of poly-1-vinyl-1,2,4-triazole. Abbreviations: AIBN, azobisisobutyronitrile; DMF, dimethyl formamide. For synthesis of nanocomposite 1 to a solution of PVT (1.9 g, 20.0 mmol) in water (36 mL) was added an aqueous solution (5 mL) containing AgNO3 (0.17 g, 1.0 mmol). The mixture was stirred intensively for 40 minutes at room temperature. Aqueous solution (54 mL) containing glucose (0.27 g, 1.5 mmol) was then added dropwise over 0.5 hours and the mixture was stirred further for 12 hours at room temperature. The resulting solution was precipitated into ethanol. The product was then filtered from ethanol, purified by dialysis against water through a cellophane membrane (5 kDa cutoff), and freeze-dried to give nanocomposite 1 as a dark-brown powder. The silver content in nanocomposite 1 was 5.0%. For synthesis of nanocomposite 2 to a solution of PVT (0.3 g, 3.2 mmol) in DMSO (10 mL) was added AgOOCCH3 (0.03 g, 0.2 mmol). The mixture was stirred intensively for 4 hours at room temperature. The resulting solution was precipitated into ethanol. The product was then filtered from ethanol, dialyzed, and freeze-dried to give nanocomposite 2 as a dark-brown powder. The silver content in nanocomposite 2 was 4.0%. Fourier transform infrared (FTIR) spectra were recorded on a Vertex 70 spectrometer with KBr pellets (Bruker Corporation, Billerica, MA, USA). Ultraviolet-visible spectra were run on a Lambda 35 instrument (Perkin-Elmer, Waltham, MA, USA). 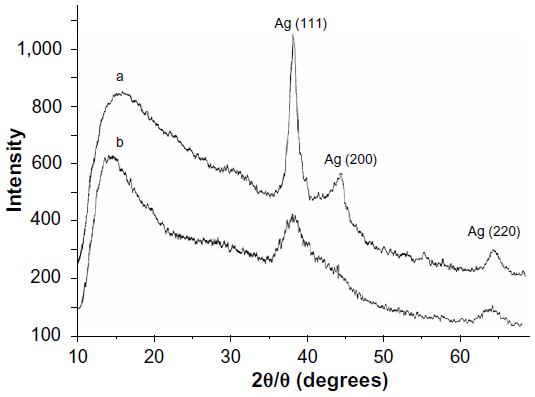 The silver content in the nanocomposites was determined using the atomic absorption analysis method (AAnalyst 200 instrument, Perkin Elmer). Microphotographs were obtained using a transmission electron microscope (Leo 906E, Zeiss, Oberkochen, Germany). X-ray diffraction patterns were obtained on a powder diffractometer (D8 Advance, Bruker Corporation). Thermogravimetric analysis and differential scanning calorimetry were performed using an STA 449 Jupiter derivatograph (Netzsch, Selb, Germany) in an atmosphere of air at a heating rate of 10°C per minute from 25°C to 700°C, the weight of the samples was 5 mg. The sedimentation stability of the sols was evaluated visually and by ultraviolet-visible spectra. The antimicrobial activity of the synthesized nanocomposites was studied against Escherichia coli (ATCC 25922), E. coli (extended-spectrum β-lactamase 2320), Klebsiella pneumonia (extended-spectrum β-lactamase), Pseudomonas aeruginosa (ATCC 27853), Staphylococcus aureus (ATCC 25923), Enterococcus faecalis (ATCC 29212), Bacillus subtilis (ATCC 6633), and Candida albicans (ATCC 2443) using a replication method.20 Daily cultures of the test strains were diluted ten-fold by the serial dissolution method using a 0.9% isotonic solution of sodium chloride up to a concentration of 105 colony forming units/mL and 104 colony forming units/mL for bacteria and fungi, respectively. In experimental sterile Petri dishes, a culture of each nanocomposite (1 mL) was introduced, and the initial solvent (phosphate buffer, pH 7.6, 1 mL) was placed in control Petri dishes. A cooled culture of beef extract agar or Saburo’s agar was added to both the experimental and control Petri dishes and melted, and the mixture was rapidly stirred. After hardening of the agar, the dishes were dried to remove the condensate from the surface of the culture, and a bacteriological loop was then used to inoculate each test strain of bacteria and fungi as plaques into the feeding medium. The Petri dishes were incubated at 32°C–34°C for 48 hours (bacteria) and at 22°C–24°C for 3–5 days (fungi). After the incubation was complete, ie, when typical growth of the tested microorganisms appeared in the control dishes, the medium containing the study composites was investigated for the presence (++) or absence (-) of growth of the bacterial or fungal test strains. The experiments were conducted twice for each culture (Table 1). Notes: (−) absence of test-strains growth; (++) presence of growth of test strains. Mixing of PVT and AgNO3 aqueous solutions during the first stage in synthesis of nanocomposite 1 led to an increase in viscosity of the solution, and viscous cream-like gels were formed. On vigorous stirring and stepwise addition of glucose, the cream-like gels transformed into dark-colored sols from which the water-soluble nanocomposite 1 was isolated. According to the atomic absorption spectroscopy data, the silver content in composite 1 was 5.0%. The optical absorption spectrum of nanocomposite 1 in aqueous solution, unlike the initial PVT and AgNO3 aqueous solutions, showed a characteristic plasmon resonance absorption band of conductivity electrons from the metallic AgNPs with a maximum at 426 nm (Figure 2). The morphology and size distribution of the AgNPs obtained was studied by transmission electron microscopy. The transmission electron micrographs and histograms for the synthesized AgNPs are shown in Figure 3. As can be seen, when glucose was used as the reducing agent, spherical AgNPs 2–26 nm in size were formed and stabilized in the PVT matrix. Most (80%) of the AgNPs had a diameter of 4–10 nm (Figure 3). Nanocomposite 1 was water-soluble and nontoxic (LD50 >5,000 mg/kg). 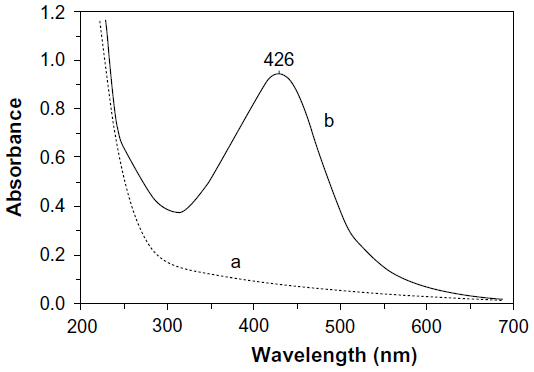 Figure 2 Ultraviolet-visible absorption spectra for PVT (a) and silver nanoparticles stabilized by PVT (b) (nanocomposite 1, using glucose as the reducing agent). Figure 3 Transmission electron micrograph and respective histogram of nanocomposite 1 (with glucose used as the reducing agent). DMSO was also tested as the agent for reducing AgNPs from AgNO3, but DMSO did not reduce them, even upon heating to 80°C. However, AgOOCCH3 was successfully involved in formation of AgNPs in the PVT matrix when DMSO was used as the reducing agent. It should be noted that DMSO not only acted as the reducing agent, but was also a good solvent for PVT. Thus, green ecofriendly reactants were used in this reaction, making the reaction conditions much milder. The reaction took place under mild conditions at room temperature with a gradual change in the color of the reaction mixture. The time evolution of the ultraviolet-visible absorption spectra is shown in Figure 4. After 0.5 hours of vigorous stirring, a light brown colloidal solution was formed, with an absorption peak at 420 nm (Figure 4), indicating the initial stage of generation of small metallic AgNPs. Increasing the reaction time led to formation of a homogeneous dark-brown sol. The process was accompanied by augmentation of the intensity of the absorption band and a red-shift of the peak position due to increased AgNP content and size. Recovery and growth of the AgNPs were complete within 20 hours, with the ultraviolet-visible absorption curves recorded after 20 and 24 hours being almost superimposable. Nanocomposite 2 was isolated from the colored sol obtained. The nanocomposite formed was a dark brown powder that was soluble in water and DMSO. Analysis of the elemental data and atomic absorption spectroscopy showed that the silver content in nanocomposite 2 was 4.0%. Use of DMSO facilitated the reaction, delivering the nanocomposite with a more homogeneous distribution of AgNPs into the polymer matrix, as seen in the transmission electron micrograph of nanocomposite 2 shown in Figure 5. In this case, the AgNPs obtained were smaller (2–8 nm) with a narrower distribution (Figure 5) when compared with nanocomposite 1 (Figure 3). 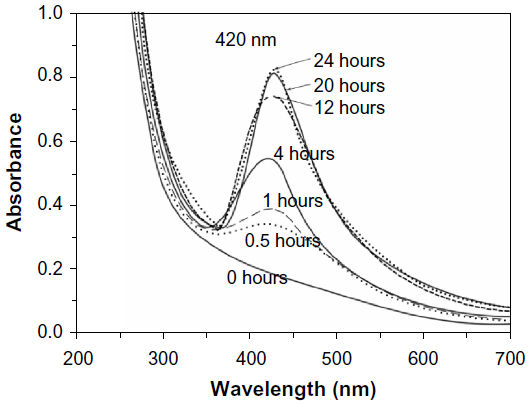 Figure 4 Time evolution of the ultraviolet-visible absorption spectra for nanocomposite 2 (with dimethyl sulfoxide used as the reducing agent and solvent). Figure 5 Transmission electron micrograph and respective histogram for nanocomposite 2 (with dimethyl sulfoxide used as the reducing agent and solvent). Figure 6 X-ray diffraction pattern for nanocomposite 1 (a) and 2 (b) with silver nanoparticles stabilized by poly(1-vinyl-1,2,4-triazole). A typical X-ray diffractogram for the AgNP nanocomposites stabilized by PVT is shown in Figure 5, where the amorphous halo of the polymer matrix and reflexes of the zerovalent metallic silver are clearly differentiated. Three main characteristic diffraction peaks for silver were observed at 2¸ 38.2, 44.3, and 64.5, corresponding to the (111), (200), and (220) crystalline planes of the face-centered cubic crystalline structure of metallic silver. The latter were identified by comparison of the values for interplanar spacing and relative intensities with the standard values for metal silver. An X-ray diffraction study showed that the average size of the AgNPs (average area of coherent scattering), determined by the Debye-Scherrer method, was 4–17 nm. The amorphous phase of the polymer component of the nanocomposites was determined by comparison with the diffractogram of PVT. FTIR spectroscopy was used to study the interactions between the polymeric matrix and the AgNPs. 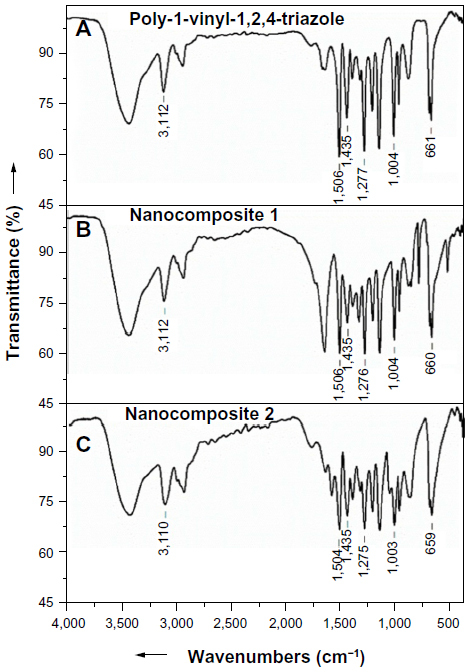 Figure 7 shows the FTIR spectra of the starting PVT polymer and nanocomposites 1 and 2. The stretching and deformation vibrations of the triazole cycle of the initial polymer were observed at 3,112 (C-H), 1,506 (C=N), 1,435 (C-N), 1,277 (N-N), 1,004 (C-H), and 661 (C-N) cm−1. The FTIR spectra for the nanocomposites were identical to those of the starting PVT. This indicates that there are no structural transformations in PVT during synthesis of the nanocomposites and that the original properties of the polymer matrix are retained. Figure 7 Fourier transform infrared spectra for the starting PVT (A), and nanocomposites 1 (B) and 2 (C). Reduction of the silver ions from AgOOCCH3 proceeds in DMSO through some intermediate stages. The reaction comprises oxidation of DMSO cations to dimethyl sulfone under the action of water and the reduction of silver ions in AgOOCCH3 to the zerovalence state. The presence of PVT in the reaction mixture promoted coordinated interaction (at the reduction stage) between AgNPs and molecules in the polymer. This interaction occurs across the nitrogen atom, located at position 4 of the heteroring, which is the most electronegative. Such coordination stabilized the AgNPs, preventing their further agglomeration and ensuring their heterogeneous distribution in the polymer matrix. The aqueous PVT-stabilized AgNP dispersion was centrifuged at 7,000 rpm for 15 minutes. A small amount of the precipitate was obtained from the bottom of the centrifuge tube and found to be completely soluble in aqueous solution again after shaking of the centrifuge tube. In addition, aqueous solutions containing nanocomposites 1 and 2 were allowed to stand for an extended period in air at room temperature, and no signs of sedimentation were observed even after 6 months of storage. This indicates that the AgNPs synthesized in this polymer matrix are stable and that the water-soluble PVT polymer has highly stabilizing ability. The results of thermogravimetric analysis and differential scanning calorimetry showed that the starting PVT has thermal stability up to 330°C (Figure 8). 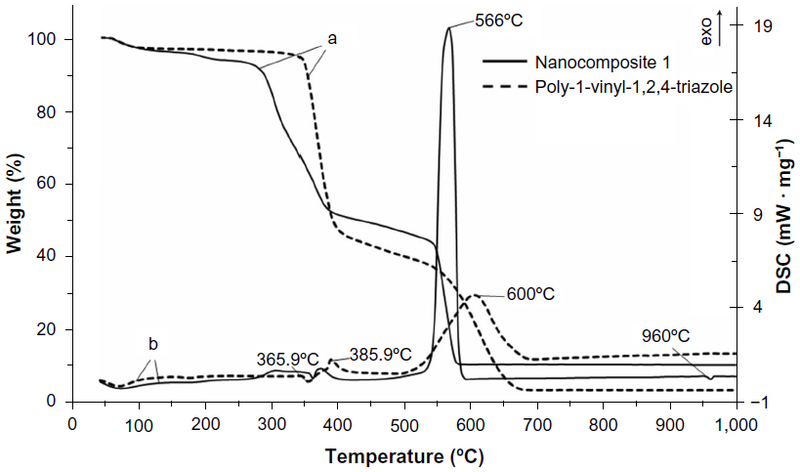 The thermal stability of nanocomposites 1 and 2 decreased by 70°C compared with that of the initial polymer, and thermal destruction of the nanocomposites started at 260°C. Figure 8 Thermogravimetric (a) and differential scanning calorimetry (b) curves for the starting poly(1-vinyl-1,2,4-triazole) and nanocomposite 1. For nanocomposite 1, it was found that the adsorbed water was released at 60°C–210°C (weight loss from the sample was 6.5%), and this was accompanied by an endothermic effect in the differential scanning calorimetry curve. This is supported by the finding of a signal on mass spectrometry at a mass number of 18. The second and third stages of thermal destruction of the polymeric component were observed at 260°C–400°C as evidenced by the presence of two exothermic effects (weight loss from the sample was 42.4%). This weight loss was accompanied by abstraction of the triazole fragment from the macromolecular chain with subsequent oxidation to H2O, CO2иNO2, which was confirmed by appearance of signals in the mass spectrum at the corresponding mass numbers (18, 44, and 46). At 530°C–580°C, weight loss from the sample reached 35.3% and the intensive exothermic effect at a maximum of 566°C took place, corresponding to burning of the carbon skeleton to yield mainly CO2 (mass number 44). In the differential scanning calorimetry curve, the endothermic effect responsible for melting of metallic silver was detected at 960°C. The decreased thermal stability of the nanocomposites was caused by the catalytic peculiarities of AgNPs, which decrease the activation energy of thermal destruction and oxidation of the polymer matrix.21 The weight loss or difference in decomposition between the PVT and silver nanocomposite was found to be 5%, indicating the presence of AgNPs (weight loss) in the PVT. On microbiological examination, it was found that nanocomposites 1 and 2 both had a pronounced antimicrobial effect towards different strains of Gram-negative and Gram-positive bacteria and fungi (Table 1). The minimum inhibitory concentrations suppressing the growth of most of the microorganisms were 15 μg/mL for E. coli (ATCC 25922), E. coli (extended-spectrum β-lactamase 2320), K. pneumonia (extended-spectrum β-lactamase), P. aeruginosa (ATCC 27853), and S. aureus (ATCC 25923), 48 μg/mL for B. subtilis (ATCC 6633), and 94 μg/mL for C. albicans (ATCC 2443). The antimicrobial activity of the nanocomposites towards bacteria is 2–3-times higher than that towards fungi and enterococci. In this study, we developed a facile green method for synthesis of monodispersed AgNPs with a narrow size distribution (2–26 nm and 2–8 nm). This method involves use of poly(1-vinyl-1,2,4-triazole), a nontoxic water-soluble polymer, as the stabilizing matrix, and glucose and DMSO as the reducing agents. The AgNP polymer obtained is water-soluble, heat-resistant, and highly stable. The AgNPs did not precipitate and or change in size even after storage in aqueous solutions for 6 months. All the reactants used for synthesis of these nanocomposites were nontoxic and environmentally benign. The nanocomposites had pronounced antimicrobial activity towards several strains of Gram-negative and Gram-positive bacteria and fungi. Therefore, these new AgNP nanocomposites in a poly(1-vinyl-1,2,4-triazole) matrix are promising materials for the design of novel water-soluble antiseptics and antimicrobial components for medical purposes, for antimicrobial components of coatings and materials (lacquers, dyes, antimicrobial plastics including implants), antimicrobial hydrogels, and superabsorbents for biomedical purposes. This study was supported by a grant from the Russian Foundation of Basic Research (13-03-01046). The authors report no conflicts of interest this work. Marambio-Jones C, Hoek EMV. A review of the antibacterial affects of silver nanomaterials and potential implications for human health and the enironment. J Nanopart Res. 2012;12:1531–1551. Shameli K, Ahmad MB, Zargar M, et al. Synthesis and characterization of silver/montmorillonite/chitosan bionanocomposites by chemical reduction method and their antibacterial activity. Int J Nanomedicine. 2011;6:271–284. Li W, Wang J, Chi H, Wei G, Zhang J, Dai L. Preparation and antibacterial activity of polyvinyl alcohol/regenerated silk fibroin composite fibers containing Ag nanoparticles. J Appl Polym Sci. 2012;123:20–25. Korbekandi H, Iravani S. Silver nanoparticles. In: Hashim AA, editor. The Delivery of Nanoparticles. Rijeka, Croatia: InTech; 2012. Caro C, Castillo PM, Klippstein R, Pozo D, Zaderenko AP. Silver nanoparticles: sensing and imaging applications. In: Perez DP, editor. Silver Nanoparticles. Rijeka, Croatia: InTech; 2010. Deng Z, Zhu H, Peng B, et al. Synthesis of PS/Ag nanocomposte spheres with catalytic and antibacterial activites. ACS Appl Mater Interfaces. 2012;4:5625–5632. Poda AR, Kennedy AJ, Cuddy MF, et al. Investigations of UV photolysis of PVP-capped silver nanoparticles in the presence and absence of dissolved organic carbon. J Nanopart Res. 2013;15:1673–1680. Barud HS, Regiani T, Marques RFC, et al. Antimicrobial bacterial cellulose-silver nanoparticles composite membranes. J Nanomater. 2011;2011:1–8. Kim BH, Oh JH, Han SH, et al. Combinatorial polymer library approach for the synthesis of silver nanoplates. Chem Mater. 2012;24:4424–4433. Darroudi M, Ahmad MB, Abdullah AH, et al. Green synthesis and characterization of gelatin-based and sugar-reduced silver nanoparticles. Int J Nanomedicine. 2011;6:569–574. Raveendran P, Fu J, Wallen SL. A simple and “green” method for the synthesis of Au, Ag, and Au-Ag alloy nanoparticles. Green Chem. 2006;8:34–38. Mocanu A, Pasca RD, Tomoaia G, et al. New procedure to synthesize silver nanoparticles and their interaction with local anesthetics. Int J Nanomedicine. 2013;8:3867–3874. Patakfalvi R, Diaz D, Velasco-Arias D, et al. Synthesis and direct interactions of silver colloidal nanoparticles with pollutant gases. Colloid Polym Sci. 2008;286:67–77. Nadagouda MN, Varma RS. Green synthesis of silver and palladium nanoparticles at room temperature using coffee and tea extract. Green Chem. 2010;2:763–770. Moulton MC, Braydich-Stolle LK, Nadagouda MN, et al. Synthesis, characterization and biocompatibility of “green” synthesized silver nanoparticles using tea polyphenols. Nanoscale. 2010;2:763–770. Khan M, Rhan M, Adil SF, et al. Green synthesis of silver nanoparticles mediated by Puicaria glutinosa extract. Int J Nanomedicine. 2013;8:1507–1516. He Y, Du Z, Lv H, et al. Green synthesis of silver nanoparticles by Chrysanthemum morifolium Ramat. Extract and their aoolication in clinical ultrasound gel. Int J Nanomedicine. 2013;8:1809–1815. Myachina GF, Korzhova SA, Ermakova TG, et al. Silver-poly (1-vinyl-1,2,4-triazole) nanocomposites. Doklady Chemistry. 2008;420:123–124. Myachina GF, Kon’kova TV, Korzhova SA, et al. Gold nanoparticles stabilized with water-soluble biocompatible poly(1-vinyl-1,2,4-triazole). Doklady Chemistry. 2010;431:50–51. Gunar OV, Kagramanova KA. Methods of evaluation of the antimicrobial activity of medicinal preparations. Pharm Chem J. 2005;39:278–282. Aleksandrova GP, Lesnichaya MV, Myachin YA, et al. Effect of silver nanoparticles on the thermal characteristics of nanocomposites of galactose-containing polysaccharides. Doklady Chemistry. 2011;439:187–189.